A Thursday night. Eager to send our wedding invites out, I don't waste a moment to order our paper. Two o'clock on a Tuesday morning? Let's get this paper order out! I was very excited that the paper vendor would prepare the envelope liners for us! Anything that would save us time. With seven different items in my shopping cart, I double-checked my order. Triple-checked my order. Things like card stock, paper stock, folders, and three different sized envelopes. What could possible go wrong? Everything looks good! At the very last minute before completing my purchase, I realized that it takes an extra FOUR to EIGHT business days for the paper vendor to put envelope liners inside one of our envelopes. Yipes! I can certain do that sort of thing. Or can I? 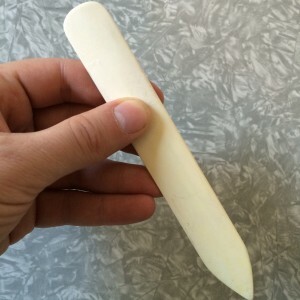 This is a bone folder. Martha Stewart told me to use one of these; and I actually have one. How does one glue envelope liners inside an envelope? Of all places on the internet, Martha Stewart comes to the rescue! 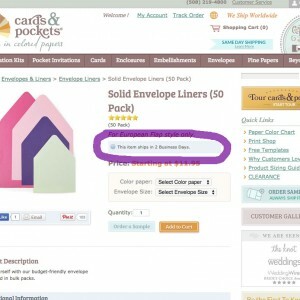 marthastewartweddings.com has a page, "Lining an Envelope How-To." I have no idea how my brain was able to compute this instructional list at 2:15am, but everything looks handable. I even have a bone folder, the device used to create crisp folds. Screw this waiting 4-8 business days for them to insert the liners. Heck, I'll even save $50. At 2:30am, I placed my order. Wanting to get this order faster, I even paid a little bit more for second day shipping. It was Monday night/Tuesday morning when I placed the order. I estimated the paper would arrive by Thursday afternoon or Friday morning at the latest. On Wednesday I got an email saying my paper was shipped. Uh what? It only shipped just now? Going to Twitter to complain to the vendor. I'm quite disappointed that ordered paper from @CardsandPockets on Friday night, yet they only processed my order today on Tuesday. The vendor responded right away. Apparently it takes two business days just to process the order for envelope liners. Nevermind installing them. This is just processing the order to send me flat liners. D'oh. The vendor very nicely pointed out that it clearly states this on the product page.